Enable Haiti is the product of the good-will efforts and generous donations of the people of Windsor and Essex County and associated friends from beyond, who want to share their good fortune by assisting the people of Haiti. The earthquake of January 12, 2010 devastated Haiti, a country that was among the least capable of handling such a catastrophe. And yet out of the rubble the Haitian people persevere and continue in their struggled efforts to return their lives to normalcy. 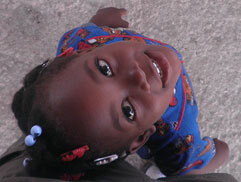 Enable Haiti aims to help the beautiful people of Haiti accomplish their pursuit of living happy, productive lives. By enabling these people to do the most basic of things in life such as eat a wholesome meal, drink a clean glass of water or by providing them the dignity of personal hygiene supplies or gently used clothing, their efforts can be placed more on fulfilling their goals. 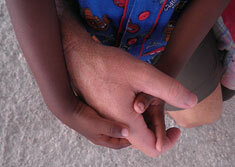 Throughout our work in Haiti, Enable Haiti has undertaken several projects. In addition to sending and hand-delivering countless containers full of food, clothing, shoes, medical supplies, water purification tablets, feminine hygiene products, and toys for children, we have also taken under our wing an orphanage for children left without parents after the earthquake, built two schools in which children can learn to read and write, supplied a rehabilitation center for people injured in the earthquake with mobility devices such as wheelchairs and crutches, and provided a hospital for severely mentally disabled children with food and industrial laundry machines in order to help keep pace with the children's need for full stomachs and clean linens. While some progress has been made in Haiti as the country continues to heal and rebuild day by day, there is still so much more work to be done. The Haitian people continue to struggle to meet their needs, children still go through their days and nights on empty stomachs, and fresh, clean water is still a scarce resource. 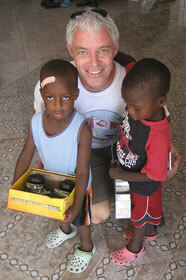 Haiti, like all nations, will inevitably rebuild but with the assistance of those in the Windsor Essex Region and our surrounding friends who enjoy lives without cause for worry about meeting these basic human day-to-day needs, Enable Haiti will continue to work to bring that moment for them closer to reality.